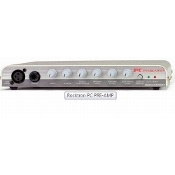 the PC Preamp is the first direct interface for guitar, bass or even vocals. Simply plug into your sound card with the supplied 1/8" to 1/8" stereo cable and you're ready to play. The PC Preamp is designed to be a permanent fixture of your computer system and fits conveniently under your monitor. The PC Preamp features 1/4" and XLR inputs, Clean and Distortion modes and an EQ shape feature. The Clean mode features a pristine clean tone with just enough compression to add punch and clarity without sounding over-squashed. The Distortion channel features over 70dB of screaming gain and sustain with a gain control to tame it down. The Distortion channel also features HUSH noise reduction with a variable threshold control to eliminate unwanted noise from noisy pickups and built-in speaker simulator circuitry. The vintage style spring reverb and built-in speaker simulation helps give that REAL amp feel through any set of PC speakers. The stereo RCA AUX inputs and level control offer the ability to plug in other external devices such as drum machines, keyboards, external mixers, etc. The PC Preamp also includes a stereo effect loop for adding additional outboard effects. New Older Stock (NOS) from Rocktron. No powerpack is included. Requires 9VAC 186mA. As pictured, serial numbers vary.